A Little Bit etc. 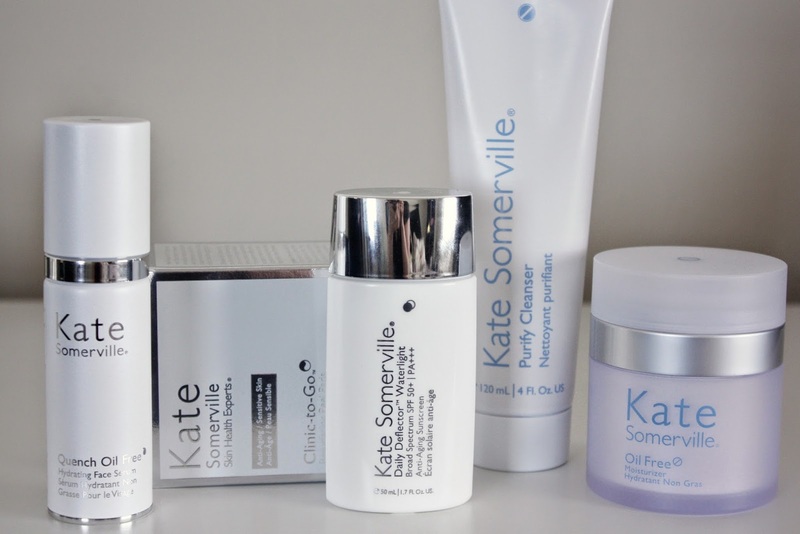 : Kate Somerville Skincare Introduction + $500 Giveaway!!!! Kate Somerville Skincare Introduction + $500 Giveaway!!!! Oh skincare, how I love you. And there is nothing better than becoming acquainted with a new brand and then subsequently falling in love with the brand! Kate Somerville recently sent over a few products for me to try and I am excited to share my thoughts on them with you. I have only tried Exfolikate before (which is amazing I may add), and after hearing all the good things from a bunch of you on my Instagram (see pic here), I had a feeling I would really enjoy the line. Spoiler alert: I did. 1. Quench Oil Free Hydrating Face Serum - This is like a drink of water for your skin. I enjoyed using it until I came back from my beach vacation - and then I REALLY enjoyed using it. I did not appreciate how intensely hydrating it was until my skin was in desperate need of moisture, and then it was a lifesaver. 3. Daily Deflector Waterlight Broad Spectrum SPF 50+ - After my recent sunscreen post, I realized that I was missing a very high level SPF lotion in the mix, and now I've found one I love! There have been a few other SPF 50+ lotions I have tried that made my skin feel awful, greasy and uncomfortable, which is why I always stuck with a small SPF level. But this formulation feels just like water on the skin and dries down to a natural matte finish. It did make my skin a bit pale when first applied which is fine for me as I am a relative of Casper the friendly ghost, but may be something to note if you have darker skin. 4. Purify Cleanser - I am not the biggest fan of foaming or gel cleansers, so I saved this product to try last. WHY???? Ugh, I almost kicked myself the first time I used it for not trying it sooner. It was soft, gentle and felt so delicate on my skin. Afterwards my skin felt neither tight, nor dry nor uncomfortable, which is so often the way with gel cleansers (you should see how many are tucked away in my drawers not getting used, ugh). 5. Oil Free Moisturizer - I saved the best for last because I absolutely adore this moisturizer. Everyone kept raving about it on Instagram and in reviews that I have read and now I know why. It is perfect for combination and oily skin. Nourishing and hydrating without feeling too heavy or uncomfortable on the face. I use this particularly when I am breaking out because while I am trying to treat the blemishes, I still need to soothe the skin and manage the dry patches. This navigates both so well and is already securing a place in my vanity permanently. And now for the best part of the post - the GIVEAWAY! Kate Somerville is going to give one lucky A Little Bit etc reader a $500 gift card to spend on their website buying all the Kate Somerville products one can possibly imagine. OMG, right??!!! All you need to do is enter in the rafflecopter widget below and I will be picking a winner on July 3rd. Good Luck!!! I love Kate Somerville products! Just click on the "Like" button on the page is all you need to do. But you can do it through the rafflecopter widget below! :) Good luck! Especially the Oil Free moisturizer - sounds perfect for me! What an amazing giveaway! I love the peel pads, Exfolicate and her oil free moisturizer. Thanks for sharing!